know how to doe it; and so, upon his death, it is lost. Making three rainbows was a pretty advanced trick for the time period, before Descartes and Newton had unwoven the mysteries of the bow. Fountains purposely designed and sited to make rainbows were something of a garden fad in the sixteenth and seventeenth centuries, when along with other hydraulic effects like weeping statues, chirping birds, and surprise jets of water they made the garden grotto a popular diversion and a great occasion for flirting. Doubled rainbows are relatively common, but I knew that to make a triple threat Isaac would have needed a mirror, and on a trip to Wilton House I found one, hanging in a rather dark corner of the Upper Cloisters. 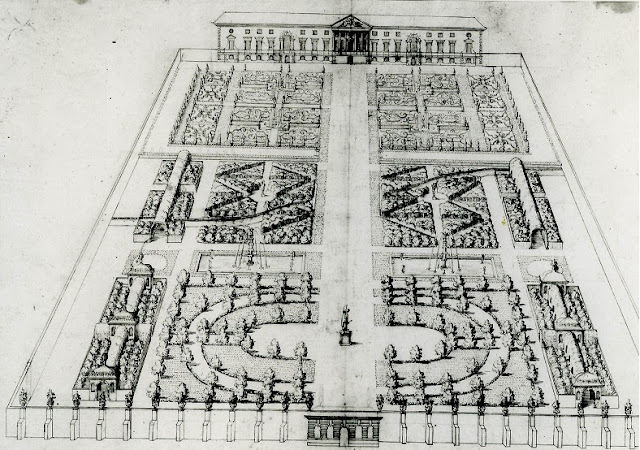 The dark lines are columns, with capitals, and above them an arching roof that was described as being like a crown or coronet in appearance, and in which we can see a green four-square garden plot, and off in the corner, some small trees and a road. 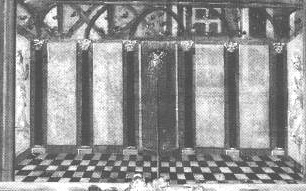 The roof of the Grotto was a mirror. Knyff had painted it reflecting the ground plane outside. The painting is now hanging in a much more prominent location in the house, which is pleasing. The Rainbow Portrait of QE1. 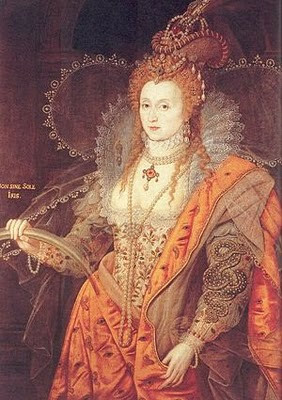 It is famously enigmatic; no one knows who painted it, or when, or why, or what it means, and it resides still in splendor at Hatfield House, built by Elizabeth’s Secretary of State Robert Cecil in 1611, though it's not clear when and how he acquired the portrait. My dear friend Valerie drove me all the way there to stand in front of it for far too long, and lean in to see its white rainbow far too close, so that we were followed around through the rest of the house by a plainclothesman. Adding to the mystery of a sketchy provenance is the painting’s torturous symbology: a serpent with a jewel in its mouth, a cloak of embroidered eyes and ears, a cryptic motto; all of which have been given equally contortionist interpretations by scholars. And never do they twist so much as when they try to explain its seminal motif: a rainbow held in the hand of a supreme ruler--an image unique in art--which gives the portrait its long-held title and yet it hardly seems a rainbow at all, just a ghostly apparition of what should be a brightly colored self. So what is a rainbow without color? What can it mean? The idea that perhaps the pigments in the bow alone had faded (though the rest of the portrait blazes with color) has been broached and discredited. What is a rainbow without color, a white rainbow? The rainbow is of course simply the product of light refraction and reflection when passing through a raindrop. Any light source will do, the moon as well as the sun, though it must be bright. It is only our own perceptive powers that cause it to fade: the limited ability of the human eye to detect color at night makes the bow seem pale and ghostly. The unknown artist of the Rainbow Portrait (which should really be called the Moonbow Portrait) has rendered his white rainbow with exquisite sensitivity, showing the impression of spectral bands that are brightest in its central region (remember Newton's ROYGBIV so the center is green) and even giving it a greenish hue; an uncannily accurate representation for the sixteenth century. He could not have known that the maximum color sensitivity of the eye is in the green wavelengths. Moonbows are rare. While you may see many solar rainbows in your lifetime, most of us will die without ever having seen their lunar counterparts. Coupled with the unusual accuracy of the bow’s portrayal, it begs the question of whether the moonbow in the painting might reflect an actual meteorological event, something special that someone connected to the painting had seen. 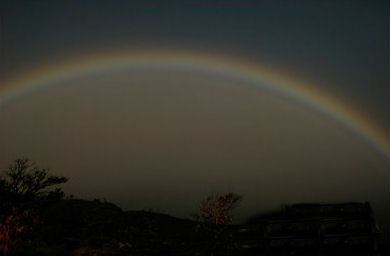 And who, who in the Virgin Queen’s circle saw a moonbow? On the tenth of September about midnight...a large and perfect rainbow by moonlight, in the shape and bigness of those formed more commonly by the sun, though in colours not so various, but chiefly inclining to a pale or whitish flame. There is much more to say--about Elizabeth’s symbolic associations with the moon and the painting’s other cryptic symbols and its motto and who might have painted the portrait, and why the National Gallery ‘could not find a place’ for my paper on the topic--but this is enough, dear readers, to show where a little garden history can take you. Outlandish Engineer”, Studies in the History of Gardens and Designed Landscapes, 29-3,169-191 (2009). So cool! The things I learn reading your blog...I will try to read your papers when the mid-semester and thesis craziness are over and I have a bit more time. What a great, thought provoking post. Slightly different topic, but do you know anything about the works, particularly, the garden works, of Clough Williams Ellis? Private gardens, not the famous Portmeirion? So very interesting! I could have gone on reading... Many thanks. Fascinating! And something to put on the list of wishes.